What is a squish clearance and why do I care? How would you like a little free power, better mileage, and more resistance to detonation all rolled into one? Yes? Well, you have the opportunity. In all likelihood, the combustion chamber in your Harley can be fine-tuned, during assembly, to give you all these things, and the only thing it'll cost you is a little bit of your time. You see, your motor, like the rest of your bike, was made in a factory, on a production line. The parts are all designed to go together and work without needing any custom rework that would slow production and add cost to the product. Every part has a tolerance, and the tolerances are specified such that if every part was off in the worst case direction, the motor still goes together and runs fine. Unfortunately, that means the typical motor (i.e. yours) isn't optimized. But when you put it together yourself, you can take some extra time and effort and optimize certain things. Squish clearance is one of those things, in fact it's one of your best opportunities. So what is squish clearance? 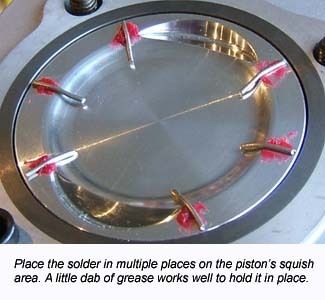 Also known as "quench", squish refers to the area or areas where the piston comes very close to the cylinder head while passing through top dead center (TDC). Even though the fire has already been lit, these areas still contain unburned air/fuel mix as the piston arrives. The piston sandwiches the air/fuel up next to the head, causing it to "squish", and shoot out toward the flame front. Think in terms of stepping on a tube of toothpaste. The result is more chamber turbulence, better atomization of the fuel, and the squish band even has a cooling effect on the fuel. Those are all good things! They result in more complete combustion (read: more power and better fuel mileage) as well as better resistance to detonation. Your squish band clearance, without your attention, will probably be in the .040" to .060" range. Ideally you'd like it more on the order of .030" (or .035" if you're using a full cast iron cylinder). So you see, there is substantial room for improvement. So what does it meant to optimize the squish band? 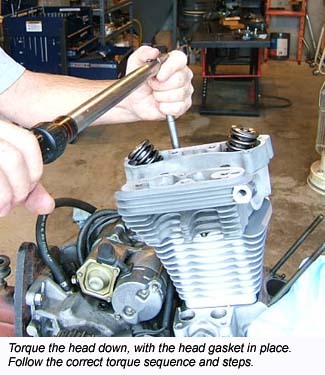 It generally means that you adjust the height of the cylinder head, relative to the piston, such that the piston comes as close to the head as we dare let it get. If we let it get too close, we can actually get contact due to things like thermal expansion and piston rock. We'll go over how to measure and adjust it in a bit, but first let's take a look at the different squish band arrangements you might find when you peek inside your motor. XL883’s and 88-03 XL1200’s use a hemispherical (hemi) chamber with no squish bands. 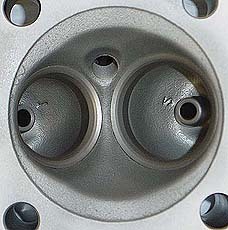 While hemi chambers give maximum valve unshrouding, they have poor turbulence and therefore do not give an efficient burn. This type of chamber is sometimes used with a radius dome piston but since the chamber is a casting, it’s difficult to get a good enough match to achieve an effective squish band. The XL883 is the only HD to still use this chamber. The Evolution Big Twin uses a flat squish band on one side only. This is a big improvement over the hemi type chamber as found in certain XL models. Axtell created a piston for this chamber with the squish band angled 30 degrees. When combined with a matching cut in the chamber, this gives the fuel a more direct path toward the flame front, and also unshrouds the valves. 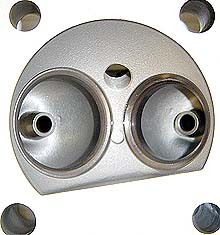 These pistons and the matching machine work are available from HAMMER PERFORMANCE. 98-02 Buell Thunderstorm motors use an angled squish band on each side of the chamber. This is the only HD product to be made with an angled squish band. Angling the squish bands like this aims the fuel more directly at the flame front and also unshrouds the valves. However, the stock Thunderstorm head has a cast-in squish band that is not very even, and the clearance in stock form is generally too wide to make the squish band very effective. We often machine the Thunderstorm squish bands to give a perfect match to the piston, which together with setting the clearance properly, makes this an excellent chamber. HD’s chamber of choice is now the “Bathtub” chamber with flat (0 degree) squish bands on each side. 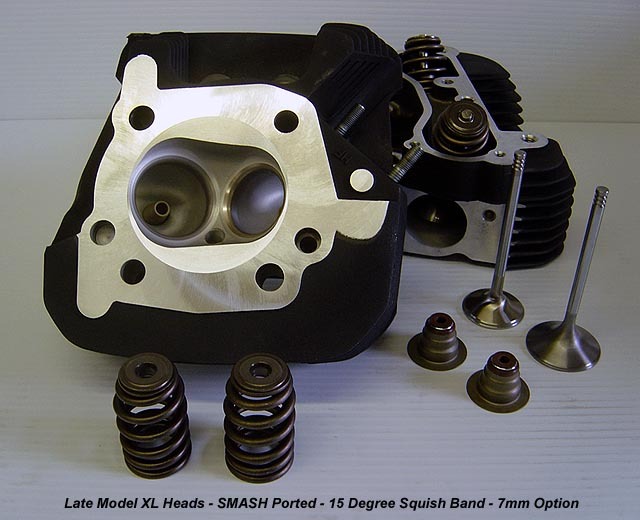 This arrangement is found on Twin Cams, 2004 & newer XL1200’s (shown), and Buell XB models. It is relatively easy to mass produce and it’s effective. It can be improved upon, however, by machining the squish bands at an angle and pairing with an angled dome piston. HAMMER PERFORMANCE provides this service and the pistons to go with it. It helps the efficiency of the chamber as well as the breathing. So how do we make this measurement? Well, as you might imagine, there are various ways. 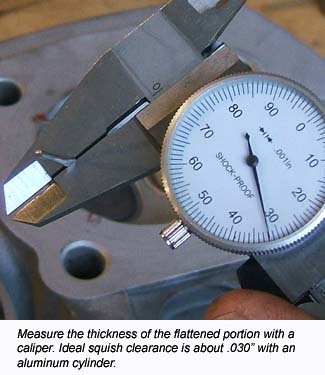 An indirect method is to use a piston height gauge to measure how far above or below the cylinder deck the piston is sitting at TDC, and add that measurement to the gasket thickness. 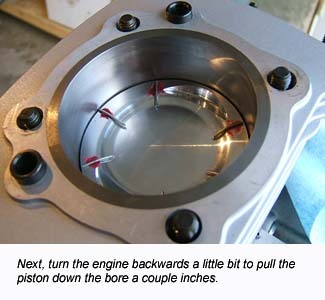 There's nothing wrong with this method, and I know engine builders who do it this way. The only real downside is that it doesn't work well on angled domes. A more direct method is to place a malleable material such as clay or solder onto the squish band, rotate the engine through TDC, remove the material, and measure it's thickness. The downside to this method is time; it takes more time than the deck height measurement method because it requires an extra disassembly/reassembly cycle of the cylinder head. But on the plus side, this method works great even with angled squish bands, and furthermore, it doesn't require any special tools. We much prefer some .065" diameter solder over clay for the measurement medium, just because it's much easier to get an accurate reading. 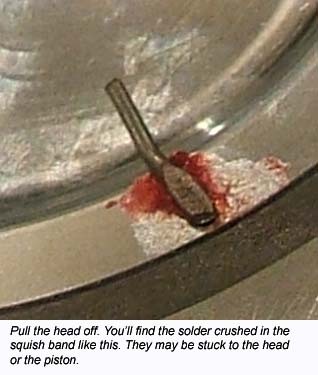 You don't have to worry about the solder changing thickness as you peel it off or make your measurement, something that's happens all too easily when using clay. This pictorial will guide you through the steps. It was done on an 883 to 1250 conversion piston, under an 883 head. 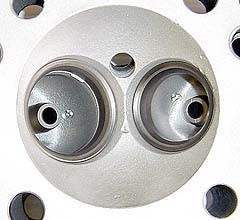 An 883 head has a hemi chamber with no squish band, as described above, but it's chamber is only 3" in diameter to match the 3" bore size of the 883. 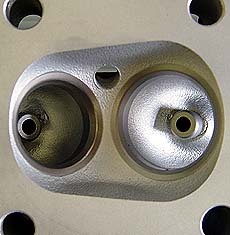 When 883 heads are used over the larger 3-1/2" bore size of a 1200, or 3-9/16 bore size of a 1250 as shown below, a squish band is gained around the perimeter of the chamber. So now that we've measured our squish clearance, how do we go about adjusting it? Case deck height, which is a function of the accuracy of the machining done on your cases at the factory. Connecting rod length - at least one aftermarket manufacturer of connecting rods offers rods that are .012" longer than stock to tighten squish. 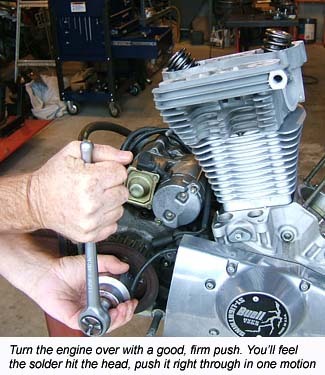 Piston compression height (the distance between the wrist pin and the top of the piston) - Sledge Hammer pistons are made with a slightly larger than stock compression height to tighten squish. Base gasket thickness - base gaskets are readily available in .010" or .020" thicknesses. Head gasket thickness - multi-layer steel head gaskets are readily available in .030" and .040" thicknesses. The diameter of the cut, when an angled squish band is cut into the head. Note that you really don't want the diameter to be smaller or bigger than the bore diameter, as you'll create pockets at the perimeter of the bore where fuel can get trapped. We call these "detonation pockets". In the real world, gasket thicknesses are the most common method for adjusting squish clearance. 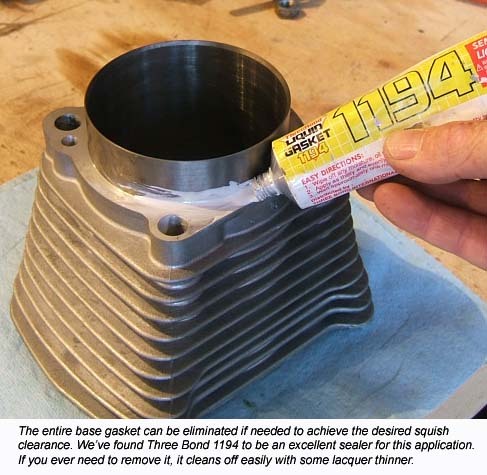 If you can't achieve your desired squish by juggling gasket thicknesses, you have the option of leaving out the base gasket entirely, replacing it with a quality liquid gasket product like Three Bond 1194. We've done this many times with no adverse effects. In the highly unlikely event that you still can't achieve the desired squish clearance, generally the best bet is to mill the cylinder deck. HAMMER PERFORMANCE can provide this service for you. For the ultimate in chamber efficiency, consider having us angle your squish bands, and use a piston with a matching dome. This is a pair of 2004 XL1200 heads that have their squish bands cut at a 15 degree angle. Before cutting, this chamber looked like the "bathtub" chamber described above. Technically, it's still a bathtub, but the angling of the squish bands makes it more efficient and gives it more power capability. It gets paired with a piston with a matching dome. An angled squish band like this helps your motor in two ways: first it aims the fuel coming out of the squish band more directly at the flame front. Second, it reduces the shelf the air must go around when entering or exiting the chamber, thus improving cylinder fill. When angling a squish band, consider carefully the angle that best suits your application. Shallow angles such as 10 or 15 degrees work well in street motors because they maintain a relatively large surface area for the squish band with a relatively small dome height, and therefore a pump-gas friendly compression ratio (a good rule of thumb for these motors is the squish band should be about 30% of the chamber area). Steeper angles such as 30 degrees start giving up a lot of squish area at a given dome height, so to get that area back, you need a taller dome, which of course tends to raise compression. But the	30 degree angle approximates the valve angles and so gives the ultimate in benefits. We generally use 30 degree squish bands only on race motors, where the dome and compression are high enough	to yield adequate squish surface area.